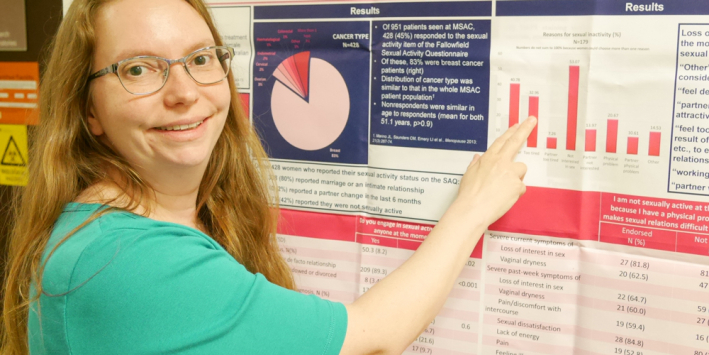 The leading work by the Women’s Gynaecology Research Centre (WGRC), particularly in the area of Menopause Symptoms After Cancer (MSAC), was highlighted at the recent Australasian Menopause Society Scientific meeting in Perth. Sexual menopausal symptoms are a common effect of cancer and its treatment but women often find it difficult to discuss them with their health care providers. Sexual problems can adversely impact on women’s relationships, self-esteem, and happiness. The Women’s MSAC clinic tailors programs to suit the individual needs of each woman, involving gynaecologists, endocrinologists, fertility specialists, sexual counsellors, Centre for Women’s Mental Health staff and specialist nurses. MSAC is also a centre for research to improve our understanding and treatment of these problems.